The wedding photography industry has changed massively over the past 20 years, not only in terms of camera kit but also in photographic style. However, there is one way in which old-school methods still work – promotion and marketing. Most wedding photographers still get future bookings by attending wedding fairs and via word of mouth. Wedding fairs are attended by thousands of brides-to-be every year and are the perfect stage to be noticed by potential customers. Not only does this type of event give you the chance to sell to a client face-to-face (which is generally more lucrative) but also to show off some of your products and hand over various marketing material. A potential customer is far more likely to connect with your business and brand if they have had physical contact with it, so allowing clients to touch and feel the products you offer e.g. wedding albums, canvases etc is likely to be more profitable. Another way to increase bookings is by word of mouth. 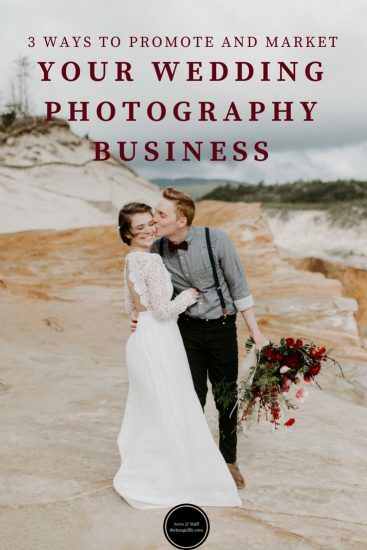 Many wedding photographers are booked by guests of weddings they’ve attended in the past, so make sure that you put your best foot forward at every wedding you attend. Be visible but not in their faces. Let potential clients see how you work and how unobtrusive you can be. Be charismatic and jolly. Give the impression that you are excited by the day. There is nothing more endearing to a potential bride than seeing someone, not related to them, getting excited about their wedding. Ask for testimonials. These are not only a fantastic marketing tool but are the next best thing to a personal recommendation. Your website is the prime place to promote and market your business. Generally, it is the bride that books the wedding photographer so try to appeal to the feminine market. Think light colours and clean layouts, and remember that a wedding day is a hugely emotional event and that should be reflected in the images you display, the fonts used and any music choices.